Discussion in 'Dynasty' started by Michael Torrance, Nov 27, 2018. 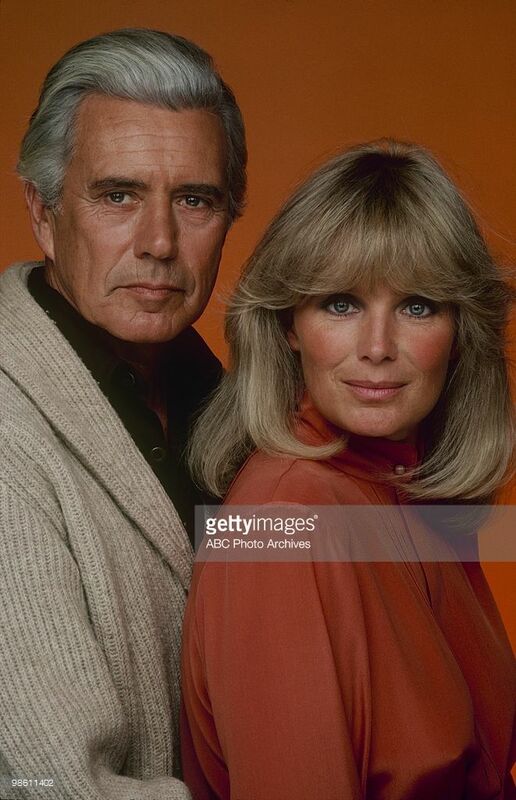 Linda Evans was contracted until the end of the 87-88's season, not until the end of 1988. If she was, she would have been in most of season 9 (as the last episodes might have been shot in February 1989). 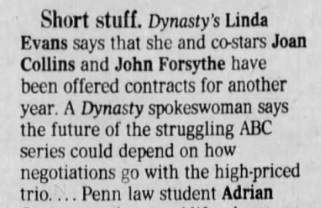 No, John, Joan and Linda were all contracted through the early episodes of Season 9 -- late 1988; Linda left while Collins and Forsythe both had to sign extensions in order to complete the season. And the last episodes were shot in April as the season started filming late due to the writers' strike. According to my knowledge, actors are contracted by season, not by year. Now, it's possible that in 1988-1989 they signed two contracts : one for 13 episodes and then one for 9 episodes (for the actors that were in every episode of course). They did that for the first season of "The Colbys". Diahann Carroll also signed two contracts for season 5, as her number of appearances was extended (22 episodes instead of 17). You're right, I forgot about the strike. It's not always season or year. In 1986, Joan and John and Linda all re-negotiated together in order to not be played off of each other, and their new two-year contracts took all three of them a few episodes into the ninth season -- which is why Linda only did a few episodes that fall (which finished airing in January 1989) and Joan and John had to sign extensions to finish out the season. This is off topic, but I love Linda's hair like that. We're not privy to a definitive answer from a behind-the-scenes source, but according to what was printed in the press the contracts signed in late 1986 were indeed valid through the end of the 1987/1988 season. 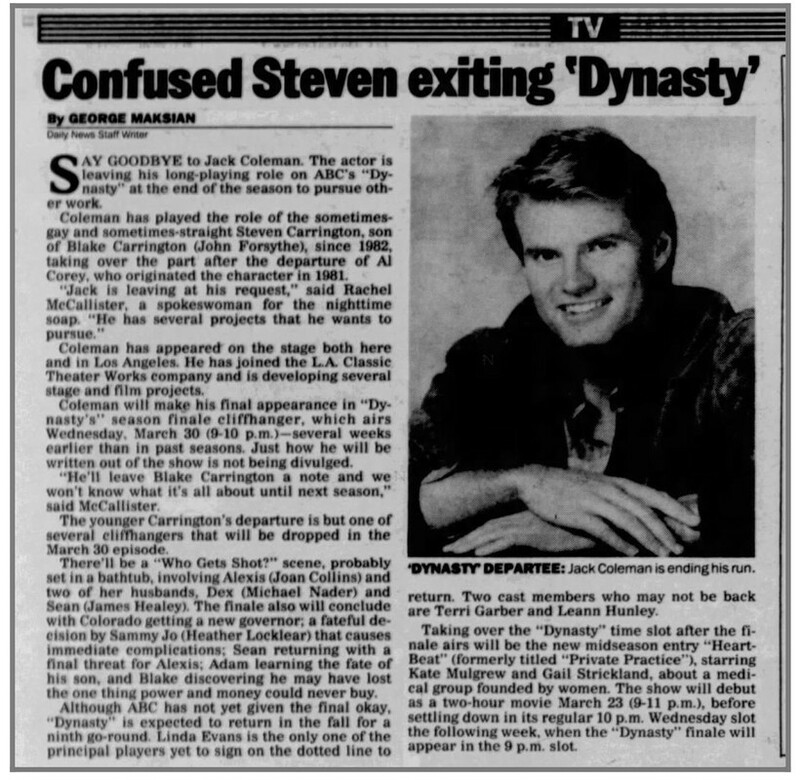 It was an unprecedented move by Aaron Spelling to call a press conference and reassure the fans -- most likely because DYNASTY had once again begun to plummet in the ratings -- that their show and stars were safe through the spring of 1988. (which is likely how she ended up negotiating a 6-episode contract with an option to do 4 more episodes). Regardless of varying contradictory news stories, the reason Joan and John had to sign contract extensions after S9 started was because those contracts expired after S9 started. 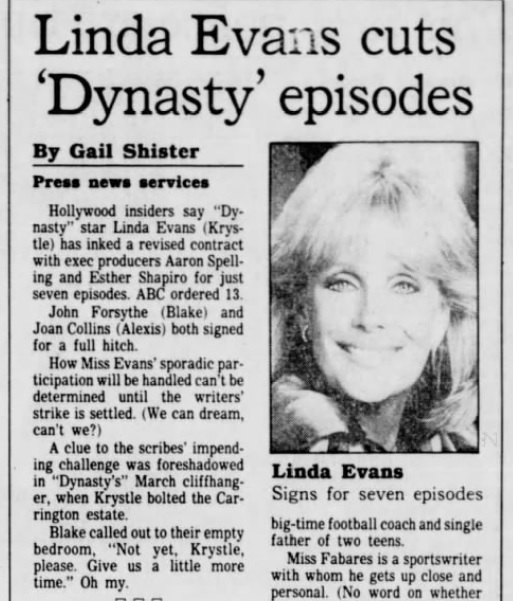 Here is an August 3, 1988 story confirming Linda Evans had signed on to do 7 episodes (out of 13 ABC had ordered by this point -- they went on to order the full season in December), whereas John and Joan have signed for a "full hitch". Therefore I assume the S9 extensions indeed had to do with ABC ordering the back 9 -- had the writers' strike taken a few weeks longer, the show would've come back in 1989 and in that case ABC probably would have kept the final season at 13 episodes and no extensions would've been needed. Thank you for this article. It helped me fully accept the final season. I am glad that Jack Coleman was not fired because of budget cuts or because of David Paulsen. I really missed Jack (or his character) in 1988/89 season. Neverthless, I am still confused that Alexis said no single word or a sentence about the departure of the most favourite child of her (unlike Blake, Krystle, Sammy Jo, Fallon or Adam). Hey, you're right! I never noticed that. Frankly, of all the things "The Reunion" got wrong, bringing back Al Corley was such an unexpected pleasure.